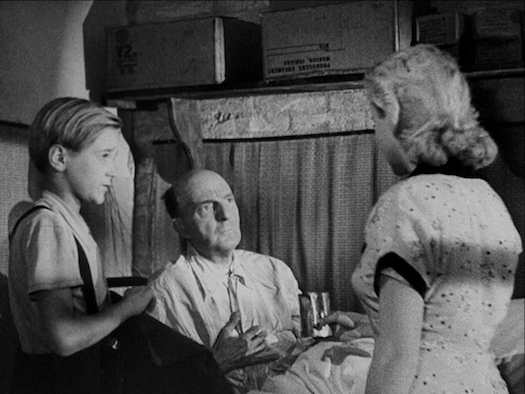 After seven years, Criterion finally offers a Blu-ray upgrade of their DVD box set, Roberto Rossellini's War Trilogy. Besides launching Rossellini to worldwide fame, the three landmark productions included in the set helped to establish the influential filmmaking mode known as Italian Neorealism. The first film of the trilogy is the ensemble drama Rome Open City (Roma città aperta; 1945), which began filming weeks after the end of the second World War. Shot mostly on location and featuring a mix of professional actors and regular people in the cast, Rome Open City breaks with the formal traditions of classical Italian cinema by placing a premium on clear-eyed authenticity. Compared to the stripped-down verité styles that would come later, Rome Open City (and all of Rossellini's Neorealistic work) is not wholly devoid of stylization, in its visuals or in its storytelling style. But the director's dedication to reproducing life as the people in his films would have actually lived it still makes for bracing and exciting filmmaking. Rome Open City is set during the period where the fascists gave up in Rome, so the Nazis swooped in and seized control. A sadistic Gestapo officer (Harry Feist) plots to ensnare and destroy the network of underground resistance fighters. At the beginning of the film, resistance leader Marcello Pagliero hides out with his comrade Francesco Grandjacquet and with Anna Magnani, the pregnant widow who is soon to be Francesco's wife. Aldo Fabrizi is a local priest whose compassion leads him to risk his neck, aiding and protecting these partisans. Maria Michi is a drug-addicted showgirl in love with Pagliero. Her neediness threatens to be the undoing of not only the man she loves, but his working-class comrades as well. Like all three films in this set, Rome Open City is a tragedy. But, of the three, it is the film most informed by a sense of generous humanism. That humanism transforms the flick's potentially melodramatic defeats -- the indelible torture sequence is martyrdom at its most exquisitely wrought -- into genuinely rousing triumphs of the human spirit. 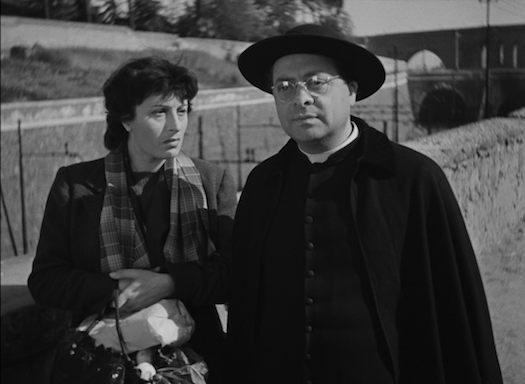 It's not uncommon now for Rome Open City to get knocked for not being as "realistic" as its reputation, especially with experienced thespians like Fabrizi and Magnani taking the spotlight. But Fabrizi and Magnani are magnificent, fully embodying characters that, in less precise hands, could be didactic symbols of Christian charity and working-class nobility. Their performances -- like the film -- are alternately sentimental and unsentimental, striking a balance that creates intense emotional impact without sacrificing depth and intelligence just to wring out easy tears. The next film in the set pushes the tension between melodrama and grit even further. Released in 1946 and titled Paisà (although retitled with the better-known variant Paisan in the U.S.), Rossellini's follow-up to his international breakthrough represents a leap in scope and ambition. The film consists of six vignettes, structured to mirror the Allied Forces' liberation campaign through Italy, from the South to the North. Each episode takes up the idea of brotherhood between Italian and American characters, but perpetually results in a downbeat ending. Rossellini seems to be suggesting that there's plenty of potential for international understanding and friendship, but these would-be "paisans" have too many roadblocks in their way. This semi-cynical tone is set in the first episode, in which peasant girl Carmela Sazio helps a band of American soldiers navigate a minefield because she hopes to search for her missing family. While the others go on a search, Carmela is left alone at a castle outpost with one American, named Joe naturally (and played by Robert Van Loon). They form enough of a friendly bond that when Germans investigate the castle, Carmela sacrifices herself for the sake of the soldier. When the Americans return to the castle and find their buddy dead, the prejudiced men mistakenly presume the "I-tie" must have done it. Prejudice short-circuits further connections in an episode about a drunk black soldier (Dots Johnson) who briefly pals around with a street kid (Alfonsino Pasca), only to have the kid rip him off when he passes out. 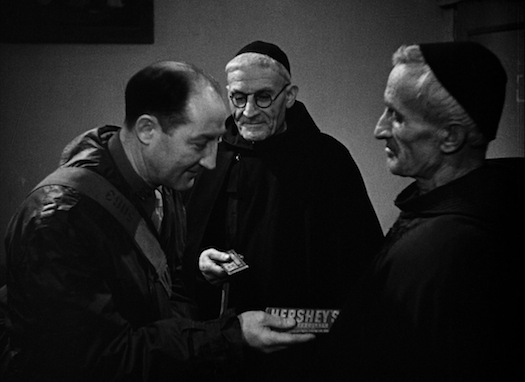 The same disconnect occurs in a later episode where three military chaplains ask for shelter at an ancient monastery, only to discover the seemingly generous monks don't know how to cope with the fact that one of the chaplains is a Protestant and another is a Jew. Two of the most satisfying vignettes come in the middle of the film. The first of these features Rome Open City's Maria Michi as a streetwise prostitute who picks up a drunk soldier (Gar Moore). Sadly, the soldier finds the idea of sleeping with her distasteful. You see, he's got a flame burning for this sweet, innocent Italian gal he met when the Americans first liberated Rome. Of course, the woman in his memory is the exact same woman trying to get him into bed for a few bucks. It took a few short months, but disillusionment with life under American occupation has set in so intensely that these two star-crossed lovers couldn't even recognize each other. It's a soapy premise, but one that Rossellini and the actors pull off with passion and conviction. The following segment is set in Florence, at a time when the city is only partially liberated. An American nurse (Harriet White) teams up with a partisan (Renzo Avanzo) to locate their respective loved ones. They wind their way through the city, dodging German gunfire while following tips from locals who have been keeping tabs on the action. It's a satisfying little adventure story, enlivened by the vibrant characters (an ex-army major who plays armchair general from his rooftop, a small band of peasants trying to sneak water across a guarded thoroughfare) encountered along the way. The concluding section of the film dramatizes a collaboration between the OSS and the partisans, behind German lines, which ends in a devastating defeat. Critical consensus over the years has it that Paisan is Rossellini's masterpiece, maybe because it is unflinching in how it shows the inhumanity of the war. There's no denying that it is an excellent movie, but I prefer the hints of warmth and optimism that permeate Rome Open City. This holds true even moreso for the final film in the set, Germany Year Zero (Deutschland im Jahr Null; 1948), which is a visceral and extraordinarily well-realized film. It is also a gloomy parable whose stark final third was a bit too much for this reviewer to swallow whole. Edmund Köhler (Edmund Meschke) is a thirteen-year-old boy, living in the ruins of postwar Berlin. Due to financial hardship, Edmund must find ways to support his family. He tries to pass himself off as older, so he can do hard labor, but his scrawny frame gives him away. He constantly scrounges for things to sell, like picking up coal that falls off a passing truck. He lives in a cramped apartment with his bed-ridden father (Ernst Pittschau), his ex-soldier brother Karlheinz (Franz Krüger), and his older sister Eva (Ingetraud Hinz). Like the characters in Rome Open City, the Köhlers live in a building overflowing with tenants. In this case, they have all been assigned by the government to live under the same roof, much to the chagrin of the live-in landlord. Rossellini manages to make this living situation feel miles away from that of Rome Open City, which felt bustling and communal; here, the home feels claustrophobic and intrusive. Like Edmund, Eva tries to scrounge together money where she can. Going out to nightclubs every evening, she snags cigarettes from would-be suitors then she re-sells them later. (Some reviews of this film characterize Eva as a prostitute, but considering Rossellini's lack of shyness in portraying that lifestyle, I don't see him even mildly hinting that Eva has crossed that line -- yet.) Karlheinz refuses to register for food rations, because he is paranoid that he will be captured instead for being a German soldier who fought to the bitter end. And so, with Papa sick in bed, everyone is hungry and suffering. 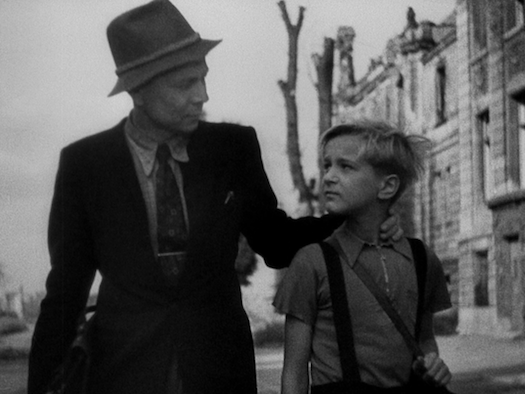 Little Edmund ends up reconnecting with a former teacher (Erich Gühne), who enlists Edmund to sell some contraband for him. Rossellini's idea of Gühne's character seems to broadly (almost vulgarly) represent the lingering sickness in the German national character, as Gühne clearly wants to groom Edmund for an unsavory man-boy relationship, in addition to getting the kid to sell phonograph records of old Hitler speeches to U.S. soldiers as souvenirs. I'm not quite sure what's more nauseating, Gühne's flawless, predatory performance paired with little Edmund's natural guilelessness, or the film's easy equation of Nazism with homosexuality (something Rome Open City does too, admittedly) and pedophilia. "Problematic" is a word that gets overused, but damned if it doesn't fit this aspect of the film. Germany Year Zero slowly reveals itself to be a coming-of-age story for a character with no future. It's heartbreaking, thanks in no small part to the open and natural performance of amateur Edmund Meschke in the lead role. The final section of the film somehow tops everything that came before it -- both within the film and Rossellini's entire War Trilogy -- in terms of gut-wrenching bleakness. It's provocative and dramatically effective, showing the intellectual and emotional rebuilding that Germany needed, alongside that of its physical infrastructure. But boy, it isn't the kind of thing you want to pop in your Blu-ray player when you're in a sunny mood. Roberto Rossellini's War Trilogy is presented on three discs, each housed in a separate digipak case. The Germany Year Zero case is a little thicker to allow room for a gorgeous 40-page booklet, including stills, credits, and essays by James Quandt, Irene Bignardi, Colin MacCabe, and Jonathan Rosenbaum. All three films have been sourced from new restorations, with Rome Open City sourced from a 4K remaster and Paisan sourced from a 2K. Part of what has long distinguished these films are their relatively gritty look and semi-documentary shooting circumstances, so it's no major surprise that these AVC-encoded 1080p 1.37:1 transfers are not immaculate. Dirt and scratches appear at different points throughout each film, but in general these flaws are offset by the stellar clarity and contrast. Germany Year Zero derives from a film print, and is darker and less nuanced than the other two films when it comes to reproducing shadow detail, but it still represents a tactile improvement over Criterion's already-strong DVD presentation. Each film is presented with LPCM mono audio mixes, with a combination of Italian and English dialogue for the first two films (unfortunately, there is no English SDH track offered; there are only optional English subtitles during the Italian passages). The final film is in German with optional English subtitles. Even more than the visuals, the audio betrays the less-than-optimal shooting conditions in which these films were produced. Most of the dialogue is clear and understandable -- with some of it clearly post-dubbed with imprecise synchronization -- but the audio is distinctly limited, with less fidelity than one might expect from a slicker film from this period. All of the bonus features are carried over from the earlier 2010 Criterion box set. Roberto Rossellini intros to each film (HD upscale, 10:05 total) - These clips from 1963 accompanied screenings of Rossellini's films on French TV. He talks about how these films were initially poorly received in Italy, but usually found favor and financial success in France. Adriano Aprà interviews (HD upscale, 41:58 total) - Three pieces with Italian Rossellini scholar Aprà, who discusses the history behind and the making of each film in the set. Audio commentary on Rome Open City - Historian Peter Bondanella's 1995 commentary is ported over again for this release. Bondanella offers a well-structured discussion of the film's themes, style, and story. He spends a lot of time debunking the assertions that the film was a stark break away from older styles of Italian filmmaking and was more like a gradual pivot. Once Upon A Time... Rome Open City (HD upscale, 52:30) - A French TV documentary from 2006, covering the making and lasting impact of Rome Open City that includes vintage interviews with the director, with co-writer Federico Fellini, and with star Anna Magnani, in addition to modern day talking heads from folks like Isabella Rossellini. Rossellini and the City (HD upscale, 25:07) - Critic Mark Shiel discusses the way that Rossellini uses Rome as an expressive tool in Open City. Father Virgilio Fantuzzi interview (HD upscale, 5:16) - Fantuzzi discusses Rossellini's relationship to religion and its representation in his work. Rossellini at Rice University (HD upscale, 13:33) - A 1970 discussion with Rossellini shot on old B&W video. It's a little hard to hear sometimes (and no subs sadly), but it's a thoughtful discussion. Into the Future (HD upscale, 30:54) - Critic Tag Gallagher offers a lightly poetic essay on Rossellini's War Trilogy. Roberto Rossellini (HD upscale, 1:05:39) - Rossellini's former assistant director Carlo Lizzani examines the filmmaker's career in this entertaining documentary. Letters from the Front: Carlo Lizzani on Germany Year Zero (HD upscale, 23:21) - A 1987 Q&A with Lizzani, as he discusses his remembrances of making the film and then reads some letters he wrote at the time. Paolo and Vittorio Taviani interview (HD upscale, 7:52) - The brother directing team behind Padre Padrone discuss discovering the films of Rossellini and that work's influence upon the brothers' shared career. Roberto and Roswitha - A text-and-photo essay by Thomas Meder, in which he describes the romance of Rossellini and German actress Roswitha Schmidt. 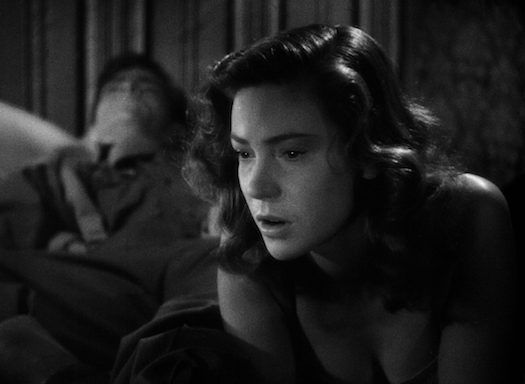 Meder theorizes that Rossellini's affair with Schmidt may have been a major impetus in Rossellini's decision to make a film about Germany in 1946. Rossellini's War Trilogy is powerfully realized and emotionally draining. It is well worth experiencing, but you certainly have to be in the right headspace to appreciate it. No new bells and whistles for this Blu-ray upgrade, but the A/V quality is strong and Criterion's original bonuses were hard to beat in the first place. Highly Recommended.